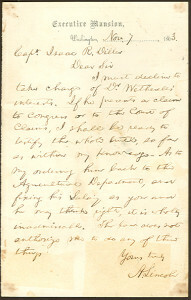 Abraham Lincoln’s autograph is one of the most sought after in American history. 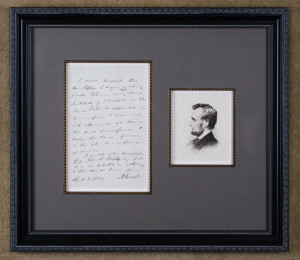 The sense of leadership Abraham Lincoln’s signature conveys, the sense of pioneering courage, human understanding and extraordinary tragedy felt in Abraham Lincoln’s autograph and signature make his signed memorabilia very popular. 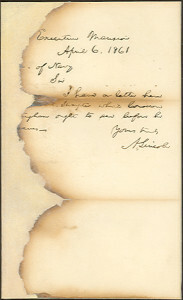 His signature was frequently cut from letters and documents by his contemporaries but more frequently Abraham Lincoln’s signed letters and signed documents were preserved intact by his contemporaries wanting to save a part of the fallen hero who had kept the Union together and freed the slaves. It is very satisfying to frequently hear from the recipients of gifts from our gallery that no other gift compares to the thrill they experience when seeing the handwriting and personal signature of an admired historical personality. It strongly evokes the sense that these people in history were actually real. What can be read in books, or seen in photographs, is never as compelling as holding an original autograph or signed letter. These bring to life historical figures in a way that nothing else can. 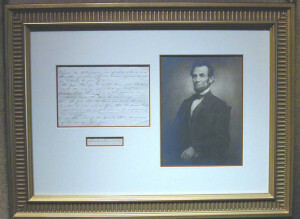 Abraham Lincoln’s signature and signed memorabilia are not rare – as Civil War President he signed many pieces – but he has been collected by institutions and specialist private collectors for decades and the demand for Lincoln’s autographs and signatures create the values seen in the pieces we offer for sale. 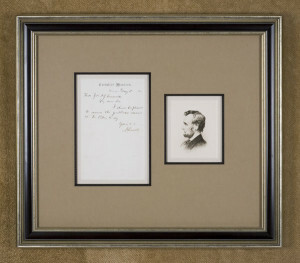 Please browse our selection of Abraham Lincoln autographs – his signature on documents and letters for sale below, or you may search our entire inventory alphabetically, by name, or by category.